At the IFA held in Berlin, LG announced its upcoming LG V30. 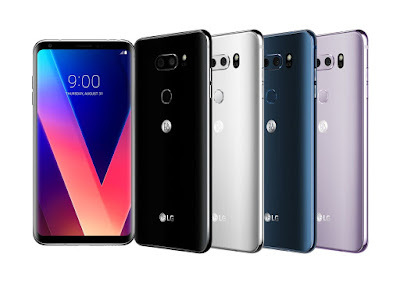 The LG V30 spots the first F1.6 aperture camera lens, the first glass Crystal Clear Lens, the first OLED FullVision display, Cine Video mode for producing movie-quality videos, premium sound with advanced Hi-Fi Quad DAC, sound tuning by B&O PLAY, and Voice Recognition. On the LG V30, the Google Assistant will be able to activate capabilities specific to the phone. Saying “Ok Google, take a romantic Cine Video” will activate Cine Video preset to Romantic. Or you can say “Ok Google, take a wide angle selfie” to launch the camera app with the setting on the front-facing camera wide angel mode. LG V30 now comes with four security options. Unlock with Face Recognition using the front camera instantaneously, even when the phone display is off. It can also unlock your phone with your voice voice using Voice Recognition. You can also choose the fingerprint unlock and Knock Code. The phone also features Gorilla® Glass 5, Corning’s most advanced tempered glass, on both the front and rear. Availability of the LG V30 will start in South Korea from September 21. It will be also released in several countries in North America, Asia, Europe, Africa and the Middle East. The V30 with 64GB ROM will come in four beautiful elegant hues: Aurora Black, Cloud Silver, Moroccan Blue and Lavender Violet 2 while the LG V30+ with 128GB of storage will be available in limited markets.